Slot none; Price 6,400 gp; Weight 1 lb. This telescoping brass spyglass functions as a normal spyglass and allows clear vision to the horizon 3 miles away at sea level. From atop a typical crow’s nest or 70-foot-tall tower like Tidewater Rock, this vision extends to over 10 miles. 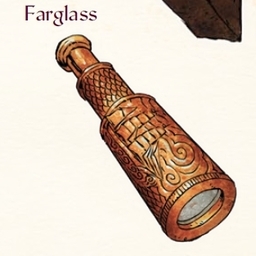 Once per day, the user of a farglass can activate a clairaudience/clairvoyance effect upon any location seen through the farglass’s lens. As long as the location is kept in sight through the lens, the clairaudience/clairvoyance sensor can move with the location. This effect lasts for up to 5 minutes.